All the features, less of the weight (and ramp angle)! That’s the goal with the Kreuzspitze EL binding. It has fully adjustable lateral and forward release, multiple riser options (including flat), and adjustment for different boot sizes. All this for less than 9 ounces! Also, its heel pins are lower than competing models, so you’ll experience less quadriceps-fatigue (especially those with shorter feet). 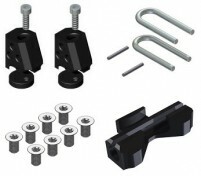 The toe piece is a simple, proven design with a sturdy construction and locked/unlocked modes actuated by a polymer lever. 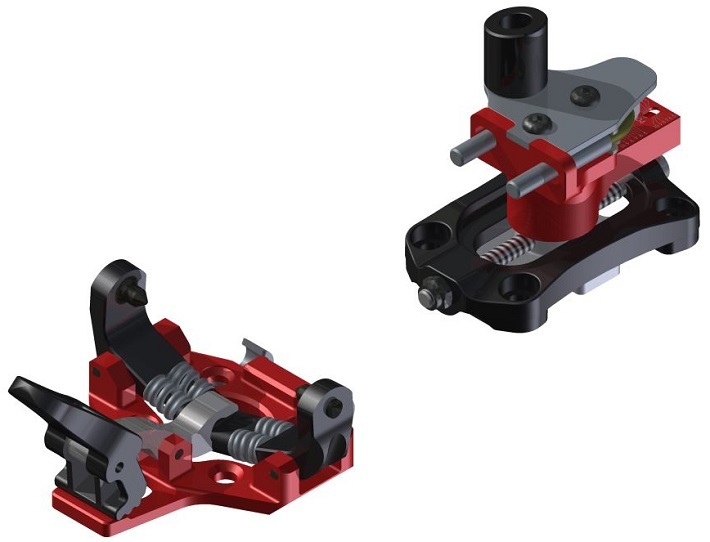 The heel piece borrows from the GT design, with a basic U-spring that slides in and out of pin-collars for forward-release adjustment. If you want to skimp on weight but not features, get your EL on! Forward release adjustment ranges from 5-10 to fit a wide range of skiers. Lateral release changes just as easily with a turn of a screw, from 5-9. Heel rides on a track that offers 24mm of Boot Sole Length (BSL) adjustment. Included riser adds an option for steep skin tracks or can be left off to save weight. Locked and unlocked toe lever positions cover you for uphill and downhill. 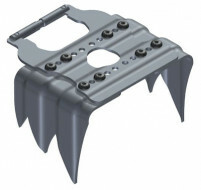 Included receptors accept Dynafit-style ski crampons that slide in from the side. Competitive pricing makes this lightweight, full-featured binding even more attractive. Bottom Line The one, the only? Can the heelpiece be rotated with a ski pole a lá the speed turn? No, that is the riser and the hole is just where the screw is. The hole is not really big enough to get your pole in it. When in climb positions. How is height of posts compared to dynafit speed radical positions.Both specs are flat+2. But what are actual height. Hi greg, they are 40.5mm and 59.5mm high. For more details, see our article on riser heights. 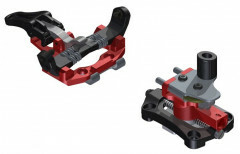 Hi, just wanting to verify, do the toe pieces share the same mounting pattern as the dynafit speed radical? Seeing different answers to that in the specs and the mfr website vs. here in the Q & A. Thanks! Hi Serge, it's "compatible", but not the same (you could reuse some holes, e.g.). It uses the older classic Dynafit pattern. The heel holes are the same, which may be what you read? For all the gory details, check out our article on mounting patterns. How do the heel risers work on this unit? Is it like the older Dynafit style where you rotate the heel to make it flat, +1, +2 volcano? What is the volcano constructed from? Thanks. Hey James! Yup, you have to rotate them. Flat, +1, +2, and ski mode via the volcanoes. The volcano is made of plastic, but it feels like the kind of plastic that you'd want to use to build a tank. Feels very solid. Dare I say, heavy duty? What is the difference in height of the toe and heel pins? Hi Stuart, the heel pins are 6mm higher than the toe pins. Do you sell the heels separately like you do for the GT binding? Hi John, at this time we do not have any heels available separately. If this matches the Dynafit Radical (1.0?) pattern, do these toes differ from the SCTT/GT toe holes? Will you be stocking the toes separately? Hi Mark, the heel pattern matches the Radical pattern, but the toes keep the same mounting pattern as the SCTT/GT toes. At this time we do not have toes available separately. also considering this vs atomic backland tour binding. thoughts? Hi Anthony, I've responded to your question below. hey, ive skied a bunch on the speed superlite 2.0, little bit on ski trab gara titan adjustable, and mostly on the g3 ion lt. although i usually always on the light and fast side, i found myself liking the g3 and gara titan much more than the dynafit simply because they seemed better constructed and were less "fussy." the dynafit was harder to get it, pins would ice easier and just felt less reliable. in any case, im planning on picking up some vapor sveltes for all around pnw use and looking for a binding to match. based on experience with g3 im interested if i should wait for the new zed binding. do you think i should wait or do you recommend this binding? i just dont want bindings that i need to think about. Hi Anthony, kind of a tough question, but I'll do my best to give you a real answer. The biggest problem is that what is "fussy" to you may be a non-issue to myself or others. In these situations, it's quite a matter of personal preference. What I can tell you about the EL is that it's a very lightweight, straightforward binding. It's best to think of it as a trimmed down Dynafit Speed Turn 2.0 in many ways. If that kind of binding appeals to you, you will likely find yourself happy with this binding. The Zed is going to be a first generation binding with all that comes with it. It appears to be very solid and well thought out from the beginning, but there's no way that I or anyone else can guarantee it won't have some unforeseen problem at this date. The Trab bindings are beautifully simple, but some people find their toe mechanism fussy as well. I personally really like and trust the Trab bindings. For me, the toe is an easy thing to get used to. The Backland binding is a solid binding and it's received a lot of praise this season as well. It's a bit heavier than most other bindings with limited release adjustment, but lighter than most bindings with as many features. I would strongly suggest that you make this choice based upon which specs and features you value the most. All of the bindings you are discussing are quite good. There are a ton of amazing bindings on the market.